Saturday brought a foot of snow to many of the Adirondack High Peaks. All the hikers were talking about it. It's funny how hiker's get. Everyone wanted to head for the snow. Non-hikers don't get it. They just shake there heads. The weekend is ruined! I of course share the hiker mindset. It doesn't matter that is May 26th. Snow is snow, and I'll take it when I can get it. Leesa is coming around to the same way of thinking. We woke up this morning and headed for the closest snow. For us that was Keene Valley in the High Peaks. Leesa also wanted to get a look at Roaring Brook Falls after all the rain of the last couple days. It would be easy to kill two birds with one stone. We parked at Roaring Brook Falls on Route 73 in Keene Valley. It was 45 degrees Fahrenheit with off and on light rain. We went to the base of the falls first. Lots of water. We've been there in the dry season when there is just a trickle. Not so now. It was great to look at. Next we headed for the Nubble. I've climbed Giant many, many times, but I've never swung over to the Nubble, a side trail to a lower bump on the shoulder of Giant. I've heard good things about it, but just hadn't done it. I had also never taken a good look at the small pond called the Giant's Washbowl, so we would see some new things today. We climbed the Roaring Brook Trail, hiking up past the top of the falls. Soon we got to the split in the trail where we wanted to fork right for the Nubble instead of continuing up Giant Mountain. No snow on the ground yet. Lots of water in the trail. Our boots were wet pretty quickly. As we climbed the trail to the Nubble, we hit the snow line at about 2200'. We found it exciting to be hiking in fresh snow at the end of May. Call us crazy. The summit of the Nubble is at an elevation of about 2750'. There was about 3" of snow at that point. We had some visibility when we first arrived, though it was starting to snow. We could see the lower part of the Great Range (the Wolfjaws), as well as Round and Noonmark Mountains. We could see the Ausable Club down below in St. Huberts. All that changed in a hurry. Bands of snow came in that quickly took away our visibility. We got pelted with snow and sleet. Our dog Rev looked at us as if she were wondering why we were here. It was fun. We stayed on top for awhile just grinning and enjoying the blowing snow. 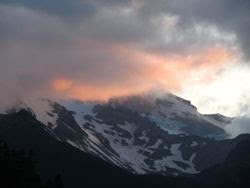 Occasionally we had a glimpse of the Giant Mountain ridge line, but it was mostly shrouded in the snow squall. Eventually we moved on and headed for the trail to Giant's Washbowl. This pond is at about 2300' and it was like a different world. All wet with very little snow. The pond is quite large but the water level was high a parts of the trail which skirts the edge of the pond were underwater. On our way back to the car we ran into a Forest Ranger who was checking the water crossings and going past the designated campsites. He wasn't headed up into the snow. He came out at the trail head shortly after we did. Still 45 degrees back at the car with on and off rain once again. We were quite soaked but it didn't matter. We had a fun through it all. Time to play a little catch up on my blog posts. Between Mother's Day weekend, and my daughter's graduation weekend, things slipped a little. Back on Tuesday May 7th, I went exploring in the Hoffman Notch Wilderness of the Adirondack Park. 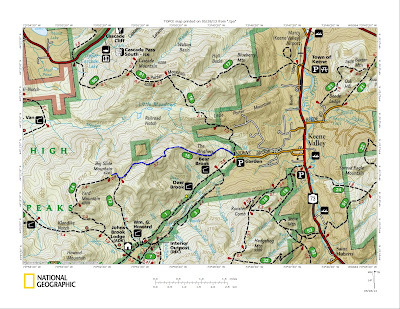 The area is relatively trail free with only a handful of trails in almost 40,000 acres. My goal was to climb Jones Hill, located just northeast of North Pond. 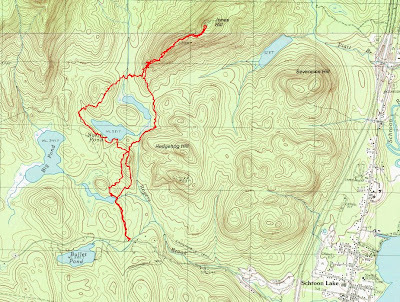 I started at the unmarked trailhead on Hoffman Road, approximately 2.5 miles east of Schroon Lake. There is a gravel pulloff with space for about 4 cars. The trail is obvious, but there are no markings until you walk in a couple hundred feet to the trail register, where there is also a sign. I've been on this trail many times while hiking to Big Pond or North Pond, but I had never gone around North Pond to climb Jones Hill. This was the day. It was cool in the morning (about 40 degrees) but it warmed up quickly. At the bridge at the first water crossing, .5 miles in, I turned right to begin a bushwhack. 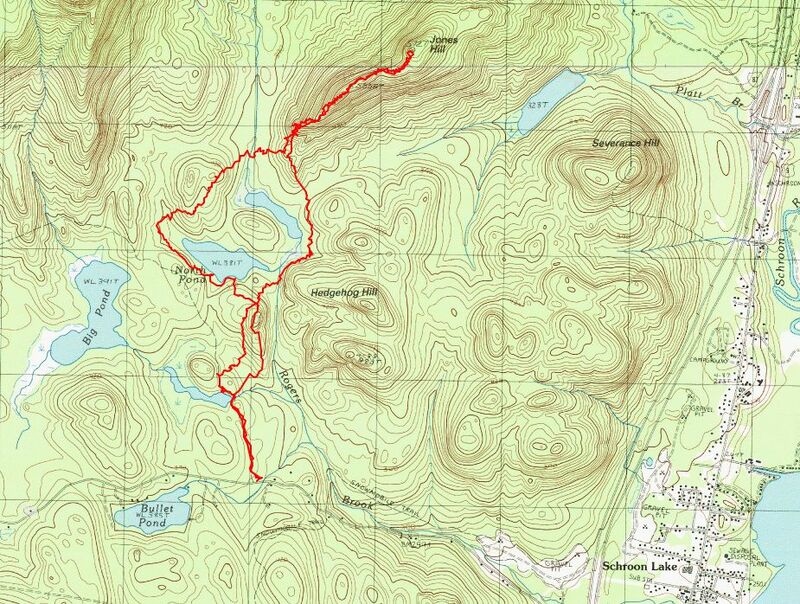 I reached Jones Pond in a few minutes and began a clockwise loop around the pond. I pretty much kept the pond in sight, and then the little pond north of it, until it was time to begin climbing. It was easy to follow the defined spine right up the ridge. It was a pretty ridge with lots of rock and some pine. The south side of the ridge was all hardwoods. As I left the false summit, the woods opened up into all hardwoods on the way to the true summit. After 5 minutes of walking I was there. Both the false summit and the true summit offered fine views and didn't disappoint. 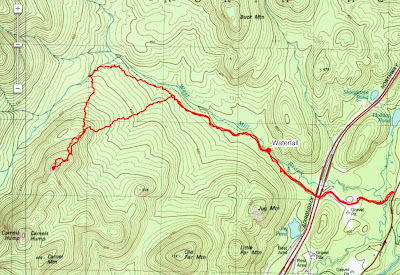 On my return trip, I went back down the southwest spine of Jones Hill and then continued my clockwise loop around North Pond until I regained the Big Pond Trail. From there it was an easy 3/4 mile walk back to the car. As it warmed up I was chased by black flies (mostly as I was coming down the spine). After that they weren't too bad. On my next trip into this area, I'll explore the valley to the north of Jones Hill where a proposed trail is expected to be constucted from the Big Pond Trail northeast to Dirgylot Hill and Route 9. If you're inclined to bushwhack in the Hoffman Notch Wilderness, be sure to visit Jones Hill. It's definitely worth while.